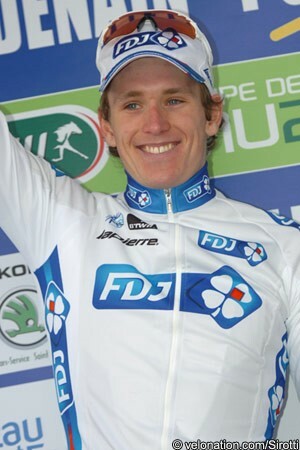 Arnaud Démare (FDJ) sprinted to his sixth and biggest victory of the 2013 season, as he took the fourth stage of the Tour de Suisse, between Innertkirchen and Buochs. The young Frenchman managed to squeeze his way around the front of the peloton the final right angle bend with less than 200 metres to go and, once he had opened up his sprint, managed to hold off the attentions of Matt Goss (Orica-GreenEdge) all the way to the line. Goss took second place, with his bike throw putting him less than half a bike length behind the FDJ sprinter, while Tyler Farrar (Garmin-Sharp) led a long line of sprinters another length behind them. "I'm really happy,” said Démare afterwards. “We had perfect timing. Throughout the day, Yoann Offredo did a great job protecting me. On the climbs, I deliberately dropped back to preserve my energy and he brought me back each time. “I knew I had to be up before the second last corner but when I saw the 200 metres sign before the turn, I said ‘go!’” he added. “So I sprinted twice, before and after turn. This shift is difficult but it is possible to do when you have super legs. “This victory is in the top 5 of my victories because winning in World Tour is always huge. And then the Tour of Switzerland is going well for us with Thibaut Pinot in fifth overall. The 174km stage saw a three-rider break from Jens Voigt (RadioShack-Leopard), Olivier Kaisen (Lotto-Belisol) and Robert Vrecer (Euskaltel-Euskadi), who escaped in the very early kilometres and managed to get more than four minutes clear in the first half. Kaisen was left behind on the 2nd category Rengg climb with around 45km to go and, with the sprinters’ teams bearing down on them, Voigt left Vrecer behind in the final five kilometres. There was nothing that the German veteran could do to hold off the peloton, however, and he was finally caught with two kilometres left. Orica-GreenEdge led into the finish, but Démare managed to squeeze between the Australian team and the barriers on the final corner and sprinted to victory. With the entire peloton finishing together there were no changes to the general classification, with Mathias Frank (BMC Racing) ending the day with his overall lead intact. Voigt, Kaisen and Vrecer attacked in the very first kilometres of the stage and, with neither of them of any danger to Frank’s lead, they were quickly able to open up a lead of 4’15”. This advantage dropped slightly to 3’36” over the 2nd category Schwanden climb, after 54.4km, but was then to remain largely constant on the flat roads that followed. With 70km to go the trio was still 3’40” ahead, but then FDJ, Cannondale and Argos-Shimano came to the head of the peloton and began to close it down. The gap quickly shank to little more than two minutes, before the chase eased off a little and, as Vrecer led over the intermediate sprint, in Schüpfheim with 50.6km to go, it was up to 2’16”. It was allowed to reach a maximum of 2’26” with 45km to go, before Omega Pharma-Quick Step took up the chase. As the short, but steep, Rengg climb began a few kilometres later Voigt began to push the pace, which saw Keisen dropped from the break. The Belgian was 1’36” behind as Vrecer led over the top with 40.5km to go, while the peloton was still at 2’10” as Marcel Wyss (IAM Cycling) jumped away to mop up the final mountain points. Wyss sat up immediately, as his IAM Cycling team began to drive the peloton on the descent, but the Swiss team soon moved over to allow the sprinters’ teams of Omega Pharma-Quick Step, FDJ, Cannondale and Argos-Shimano resume the chase. Kaisen was quickly caught but, as Voigt led onto the 4th category Rengglochstrasse with 26km to go, the peloton was still 1’50” behind. Over the top with 25.2km to go, the duo’s lead was still 1’48” as the sprinters’ teams took care not to put their big men into the red. With 20km to go though, the gap was down to 1’25” and, as Voigt took the second intermediate sprint, in Stansstad with 13.5km to go, and the peloton followed just 50 seconds later. Neither of the leaders was giving up but, with ten kilometres still to race, they had just 36 seconds of their advantage left. There was confusion with eight kilometres to go as Voigt and Vrecer caught up with a bottleneck of race vehicles, waiting for a railway crossing to open, and were forced to check their pace. Thankfully the race was able to continue, as the cars and motos were able to move before the riders had to physcally stop. Omega Pharma-Quick Step was in full cry at the head of the behind them, with the gap down to just 30 seconds, but neither of the two leaders needed the disruption to their effort to hold the Belgian team off. Tom Boonen was sat at the back of the Belgian team’s line, but the Belgian champion had Peter Sagan (Cannondale) ominously tucked in behind him. As the leaders arrived at the five kilometre banner Voigt attacked and powered away from Vrecer in a last ditch effort to hold off the peloton. Orica-GreenEdge had joined the chase by now, however, and was now just 20 seconds behind the German veteran. Vrecer was caught at the three kilometre banner as the peloton swept by, but Voigt was just holding them off. The RadioShack-Leopard rider was just six seconds ahead, however, and was finally hunted down before he could reach the two kilometre banner. Team Sky and Saxo-Tinkoff led the peloton into the final kilometre, but Orica-AIS soon took over; FDJ was present in force, however, and it was Démare that managed to get in front around the final corner with just under 200 metres to go. The Frenchman powered towards the line, with Goss trying to get alongside him, and just managed to hold off the Australian as he hit the line.